Details relating to the Portuguese Commemorative of 2012. 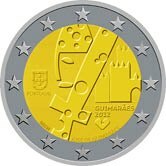 The coin celebrates the designation in 2012 of the Portuguese town of Guimarães as a European Capital of Culture. Since 2001 the old city of Guimarães is part of the UNESCO World Heritage. Guimarães has been called the cradle of the nation as the first king of Portugal was supposedly born there. In the inner circle is a highly stylised representation of the king (Dom Alfonso Henriques) together with his sword. The building on the right of the inner circle represents the 12th century castle. To the left – nine o’clock – is the shield of Portugal together with the name of the issuing country thereunder. Directly underneath the castle is the name of the town, the year of issue and the town’s logo. The mint mark (INCM) appears at the bottom to the left of the sword and the name of the designer ”JOSE DE GUIMARÃES” to the right. From Portuguese Commemorative 2012 to euro coin collector.